Scottish Dive Conference 2015 - Save The Date! The 2015 Scottish Dive Conference will be held on November 21st 2015 at Stirling University. Details of this years lineup will be announced over the coming months, so make sure you like the Scottish Dive Conference Facebook page to keep up to date with all the excitement. ScotSAC HQ is open again following illness. There's quite a lot of work to catch up on, but please be assured that I'll do my best to respond to all queries that have come in as soon as I can. Tomorrow is your last chance to buy your tickets in advance for the Scottish Dive Conference this Saturday. You can buy yours here until 6pm tomorrow (Thursday 13th November). A complete line-up can be seen below, and on the SDC Facebook page, along with a schedule so you can plan ahead and get the most out of your day with us. Deep Sea World are offering a Junior shark encounter (valid until 1/9/15). This is valid for children (age 8-15) regardless of having dived before or not. They'll be diving on a platform in their main tank with the sand tigers coming real close. William Shiel is offering a day's diving for 2 people at the Farne Islands. Check out the prizes on offer on our website here, or on the Facebook page here. The photography competition rules and fantastic prizes can be found here, so bring your prints with you on the day. And finally, don't forget about our disco/ceilidh taking place in the Stirling Court Hotel where you'll be able to relax along with the speakers and helpers. Tickets are available here. We look forward to welcoming you all to Stirling University on Saturday. Scottish Dive Conference schedule lands, and more speakers announced! There are just two more days to buy your tickets online for the Scottish Dive Conference at Stirling University, and the speakers and raffle prizes just keep rolling in! Andrew Fox from Rodney Fox Shark Expeditions comes all the way from Australia to talk to us about shark diving with a difference! Steve Millard of Learn2freedive will talk on Freediving. He is Apneists UK Head Coach and an AIDA Instructor Trainer. You can take a look at the full line up of speakers on our Facebook page here. Not sure who to see? Use our conference speaker schedule below to plan your day. The atrium area of the University will hold a number of brilliant stands and stalls, more information for which can be found here. AP Diving are giving the chance to win a New Commando Escape Travel B.C.D. Forth Element have developed a new top quality, super warm under suit. Be one of the first to own one! Interested? Not bought your ticket yet? Click here to buy your advance ticket for £20, but be quick - you only have until 6pm on Thursday 13th November to buy your ticket online. 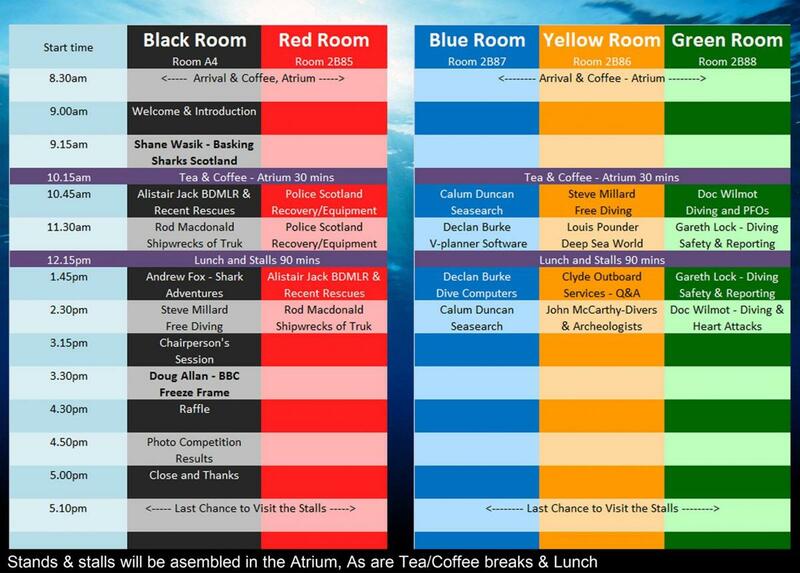 After you have spent your day buying new gear and listening to all the interesting talks, why not stay a bit longer and relax along with the helpers and speakers in the Stirling Court Hotel in the University grounds. We have a combined Disco/Ceilidh organised with a traditional stovies supper at half-time to keep you going. Tickets are available here. Folk can start arriving from 7:30 with the dancing kicking off at 8pm. You may find some folk propping up the bar earlier. We will have a couple of traditional games to keep you on your toes, but the main thing is to relax and enjoy yourself. Dress code is come as you like, but we advise against wearing your dry suit, a kilt would be quite warm enough! We have a specially discounted rate for Conference goers that want to stay over in the Stirling Court Hotel, so contact them directly - call 01786 451666 (www.stirlingcourthotel.com) and explain you are there for the Dive Conference. If you are unable to obtain discount contact the SDC mailbox (scottishdiveconference@hotmail.co.uk) and we will try to ensure you get the special rate. Alternatively there are loads of hotels and B&B nearby (for example, have a look at www.destinationstirling.com/book-your-stay/).